Wanganui East's first defence of the Jacques Cochonnet Trophy was away at Kapiti. A slow start saw them down 1-2 after the first round. Previous history. Kapiti's first defence will be away to Horowhenua. 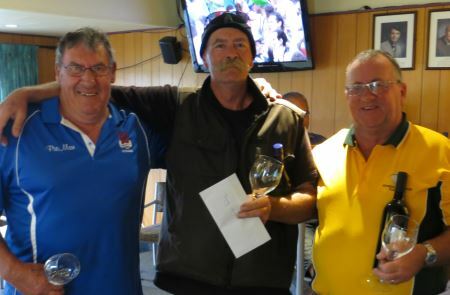 Six clubs were represented in the Champion of Champions Triples played at Otaki. The Kapiti team went through undefeated to win the title. Fourteen teams are playing in the Hawke's Bay Autumn Triples at HBLTS in Napier this weekend (9/10 April). The start time is 8:30 am for 9:00 on Saturday and 8:00 am for 8:30 am on Sunday. Maurice Belz, Junior Puleitu, and Georgio Vakauta and Sharon Cannon, Dez Grant, and Sarah-Jane Wright were the only two undefeated teams after the first day's play at the Hawke's Bay Autumn Triples. Thankfully the forecast rain stayed away, although there were a few showers, as the Westpac marquee was stolen overnight. It looks like the curse of the top qualifier is spreading beyond the Wellington region. Maurice, Junior and Georgio continued on their winning way through the morning round only to come unstuck in the semi-final against Sharon, Dez and Sarah-Jane going down 11-13. In the other half of the draw, seventh seeds Dave, Pete and Horgy also went through undefeated in the morning round. In the semi-final they defeated eighth seeds Bob, Lee and ten year old Levi playing in his first tournament. In the final, Dave, Pete and Horgy raced to a 7-0 lead after two ends, which became 10-3 after four ends. Sharon, Dez and Sara-Jane fought back, but they were always under pressure eventually going down 13-9. Fourteen teams have entered the WPA Women's Doubles to be held at Kapiti on Saturday, 16 April. Eleven teams have entered the WPA Women's Triples to be held at Kapiti on Sunday, 17 April. Twenty teams from seventeen clubs are taking part in the National Club Championship at Rotorua next weekend (23/24 April). Fourteen teams took part in the Women's Doubles at Kapiti. The format was a 4 round snake followed by knock-out in groups of four. In the Trophy final, Claire Bradburn and Monica Smiler beat Shirley Madgwick and Trish Smart 13-8. Margaret Mordecai and Barbara Nicholls won the Plate 13-6 over Christine Strichen and Claire Wilson. The Bowl was won by Ann Hogg and Shirley MacDonald 13-2 from Rosemary Barrack and Gabbie Kanel. 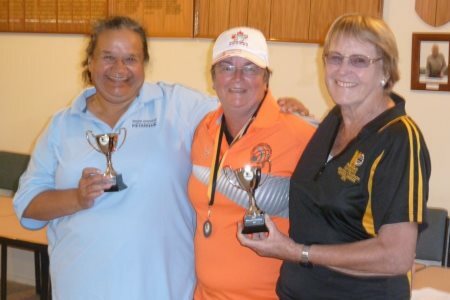 Christine Daykin and Judith Smith won the Bowl Consolation 13-11 over Jan Poland and Judith Williamson. 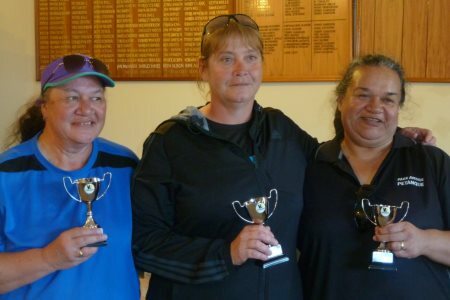 Eleven teams took part in the Women's Triples at Kapiti. The format was a 4 round snake followed by knock-out in groups of four. In the Trophy final, Yvonne Futcher, Annick Le Guen and Monica Smiler beat National Women's Triples champions Sharon Cannon, Christine Strichen and Claire Wilson 13-6. The Plate final was won by June Cody, Jo Maxwell and Lynne Shepherd 13-6 over Jan Poland, Yvonne Reeks and Judith Williamson. Francis Johns, Margaret Mordecai and Marilyn Trembath won the Bowl final 13-4 over Erica Drake, Catherine Maher/ and Viv Pender. A record twenty teams are taking part in the Club Championship at the Government Gardens terrain in Rotorua. With the increased number of participants the Doubles has been dropped and replaced by a second day of Triples. The two days will be run as two separate five round Swiss tournaments with initial seeding for Saturday based on last year's results. Seeding for Sunday will be based on Saturday's finishing order. Bay View dropped two games to top the rankings on Saturday. Defending champion, Herne Bay Green also dropped two games, but were held to a draw in another game to be in second place 1.5 match points behind. 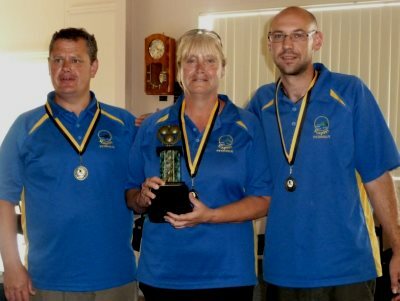 Bay View A (Maurice Belz, Sharon Cannon and Geoff Greer) and Wanganui East A (Dene Futcher, Tony Simpson and Christine Strichen) won all five games. Herne Bay A (Bob Bridge, Allan Fletcher and Pam Jenkins) had 4 wins and a draw. On Saturday the team pairings were A vs. B. On Sunday, it was A vs. A and B vs. B. With both Herne Bay Green and Wanganui East dropping a game in the morning rounds, Bay View increased their overnight lead to 4.5 match points. Herne Bay Green and Bay View each won one game in their third round match to maintain their lead. The final pairings saw Bay View (21) play Mange Cailloux (18) while Herne Bay Green (18) played Masterton (18). Bay View and Herne Bay Gold won both games to secure first and second place respectively. Wanganui East leapfrogged Masterton and Mange Cailloux by defeating Kapiti to grab third place. In amongst the main event, a separate competition was taking place between the seven clubs who fielded all Senior (over 60) players. Kennedy Park emerged as victors, with Northcote Red and Alexandra claiming the minor prizes. Twenty-four players are taking part in the Regional Women's Singles this Sunday (1 May) at Horowhenua. Twelve teams have entered the Khandallah Mixed Doubles this Saturday (30 April).